The Johnson Controls Asia-Pacific headquarters in Shanghai, China, is one of the most sustainable corporate complexes in Asia. In the summer of 2017, the campus opened as the first building in China to earn three green certifications: LEED NC Platinum, the World Bank’s EDGE, and China’s own Green Building Design Label. Although just one example, the Johnson Controls building is indicative of a larger move toward green building worldwide. According to the World Green Building Trends 2018 report, three emerging trends in green-building technology are advancing the sustainability revolution in architecture: energy-analysis tools used at every stage, the promise of generative design, and the use of data from design through the building’s entire lifecycle. Dodge Data & Analytics, publisher of the report, surveyed more than 2,000 architecture, engineering, and construction professionals and found global growth in green-building projects: 47 percent of industry professionals expect more than 60 percent of their projects to be “green” by 2021. 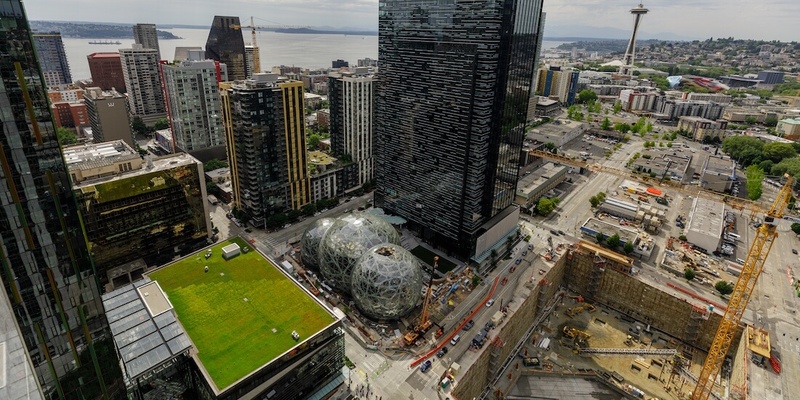 NBBJ, one of the architecture firms surveyed for the report, takes green building quite literally for its project The Spheres (Amazon’s new Seattle office complex)—its interconnected steel-and-glass domes form a conservatory for more than 40,000 plants from the world’s cloud forests. However, the report defines “green” projects as including, at a minimum, efficient use of resources; waste and pollution reduction; high indoor-air quality; and as much renewable energy, nontoxic and sustainable materials, occupant quality of life, and environmental adaptation as possible. Many incentives now entice architecture and construction firms to create buildings that meet those requirements. Owners are seeing a 10 percent or greater increase in asset value for new green buildings compared to traditional ones—as well as decreased operating costs and a shorter payback period. Survey respondents were also much less concerned with the higher cost of green building, with only 49 percent of them citing it as a factor, compared to 76 percent in 2012. Continue reading the full article at Redshift by Autodesk.